Bodhi and Sol Life offers a variety of different services, each suited to fit the individual’s needs; offering bodywork with specialties in Thai Yoga Bodywork and Ayurvedic Abhyanga Massage. In addition Tarot Card Readings are also offered. By working with the individuals energy gridlines and physicality’s we can make any service a unique and sophisticated one. 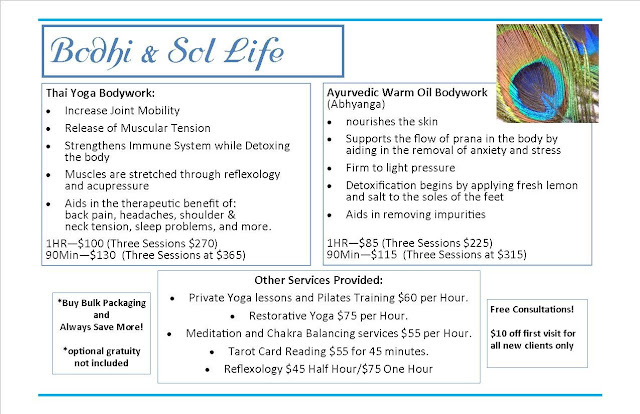 Liz (owner), has multiple certifications in: Thai Yoga Bodywork, 200RYT, and Ayurvedic Abhyanga Massage. She has also been reading Tarot for almost 20 years. You can find her space and services in LiveTechnology Holdings.